When I was considering how to decorate a pink baby girl nursery, I had a difficult time imagining the end results and making a decision as to which direction to take. One thing that was definite from the start was that I wanted a pretty and simple design with furniture that had clean lines. I wanted both the furnishings and the décor to be light in color to complement the abundance of natural light that the room gets. See more examples of how to decorate a pink baby girl nursery that is not too pink in our picture gallery. I didn't want to make a mistake with choices that I would easily become tired of. I wanted to feature colors that would be easy to find and to use in this project so I went with pale pink and white accented with touches of metallic gold and black. It was relatively easy to locate decorations in these colors and it was fun experimenting and putting everything together. I am not a big fan of traditional nursery themes, so I knew I would just have to choose a few colors to work with. One of the most difficult steps in the process for finding the right shade of pink paint for the walls. We tried tons of sample colors that were always too pink or too white until we finally found the perfect shade by Behr called "Hush Pink" that I absolutely love! The color is actually softer in person than the pictures indicate. 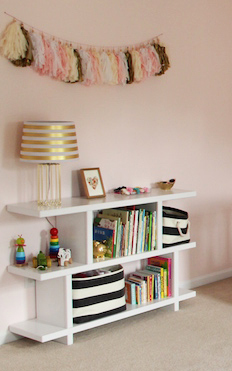 All of the photos on this page are credited to The Life of a Wife Blog's nursery tour. Please visit Sherri's blog to see more photos and decorating tips for your own DIY projects. Once we made the final decision on the pink paint color for the walls, Caleb painted every inch of the walls from the ceiling to the baseboards to closet doors. When he was finished, the room looked so fresh and clean! 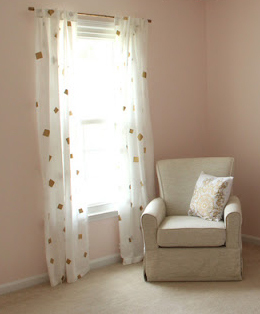 Finding the perfect curtains for a pink nursery. The next item on the to-do list was to order the white and metallic gold confetti nursery curtain panels only to find that our selection would be on backorder for two months. When they arrived we hung them on basic curtain rods that we had spray painted with metallic gold paint. While waiting on window treatments, Caleb began building the nursery furniture. We had briefly shopped for dresser changing table combos and did not find one at a price point that fit our budget. We found that most were either too small or did not have sturdy construction. Since Caleb is so talented and is willing to make anything my heart desires we decided he would make the all of the furniture necessary for the nursery except for the crib. He patterned the dresser after a similar one that we saw and liked at Pottery Barn Kids (refer to the resource list below). This project was just completed a few weeks ago; it was quite a challenging DIY woodworking project! I also made sketches of the bookshelf that I wanted and he built it in no time. While Caleb was busy with the DIY bookshelf project and building the dresser, I began shopping for a crib. I found one that I loved but was not so impressed with the price. I was very pleased to one that was very similar for sale at a fraction of the price of my original choice. Shopping for a glider was also a challenge since I wanted a very light colored glider which I learned would be surprisingly difficult to find within our nursery budget. The stores in town had none that I liked, so I had no options other than ordering one online without seeing it in person. The first one I ordered was the wrong color, but the second one was perfect. Choosing decorations was the most fun we had in decorating the room. I searched for a metallic gold lamp for several months until I finally found both a base and a shade I could mix and match. We spray painted the picture frames gold to match the curtain rods. The "Love Never Fails" print was found in a shop my sister recommended and the Rifle Paper Co. print was left over from a previous home decorating project. The other wall decorations are wooden signs that a friend made as baby shower decorations. She is so amazingly talented and made the signs knowing they would match my nursery colors. She allowed me to take them home after the shower as part of my gift and they are the perfect addition to the nursery! The rugby storage bins with black and white stripes were on my baby registry. Beyond that, I picked up the occasional odds and ends at Target or Home Goods. I am so very pleased with our perfectly pink baby girl nursery and I cannot wait to bring my daughter home to it! Thanks so much to Unique Baby Gear Ideas for letting me share!